This entry was posted in Health & safety culture on 2018/04/18 by Susan. 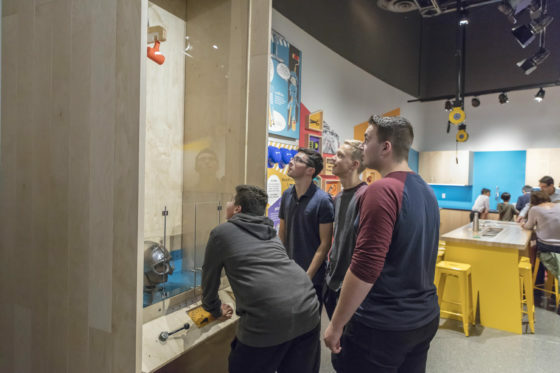 A new interactive exhibit created by Science World and WorkSafeBC lets visitors get hands-on with safety. This video shows how and why they made it. How is the world around us designed for safety? What is it like to experience hearing loss? How does a helmet protect your head if a hammer drops on it? These are a few of the questions visitors can answer at Tinkering Space: The WorkSafeBC Gallery, a new exhibit at Science World in Vancouver. Even though the gallery is geared toward kids, visitors of all ages will enjoy the hands-on, interactive features of the exhibit. WorkSafeBC partnered with Science World on this project as part of their 100-year anniversary commemoration. “We wanted to be able to partner on something that would be able to impact the next hundred years. The big overlap is the audience: it’s the kids. They are the future generation of workers in British Columbia and they are the target audience of Science World,” says Kerri Buschel, WorkSafeBC’s director of Experience and Marketing, in the video below. I wrote about WorkSafeBC’s landmark anniversary in my post Videos share highlights from WorkSafeBC’s 100-year history. Have you been to Tinkering Space yet? Do tell! In the meantime, check out this video for more information about the concepts behind this innovative display.